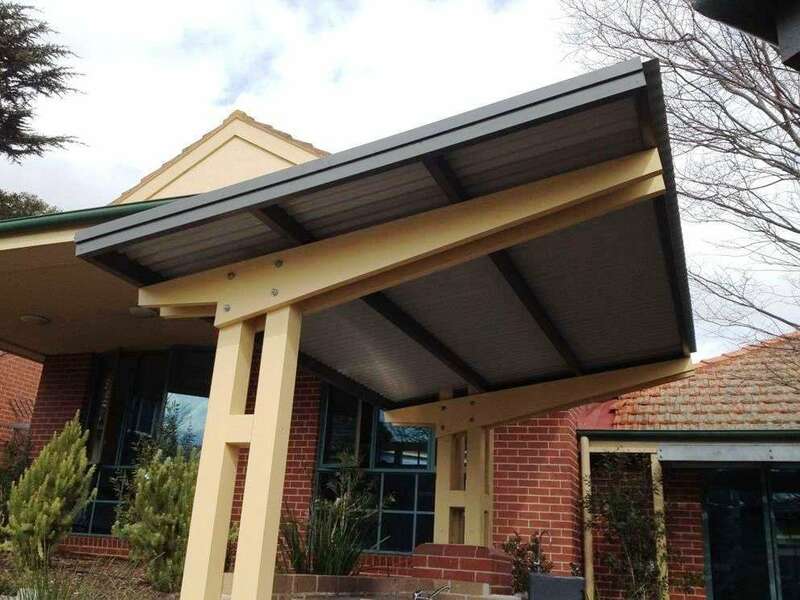 Providing all-weather protection to the BBQ, this cantilevered awning structure was built for a private school, designed to blend in with the existing school buildings. Note in particular the matching double posts with cross spacer. The work was carried out on weekends, so as to not disrupt school activities, and to ensure the student safety. 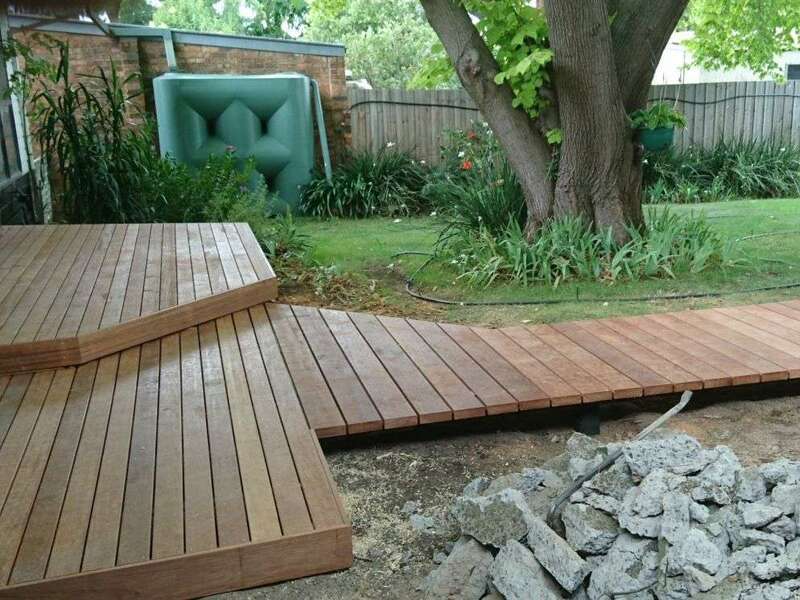 Tiered, shaped 90mm merbau deck with boardwalk connecting family room with backyard studio/outdoor room. It features 140x42 thick screw fixed merbau planks. 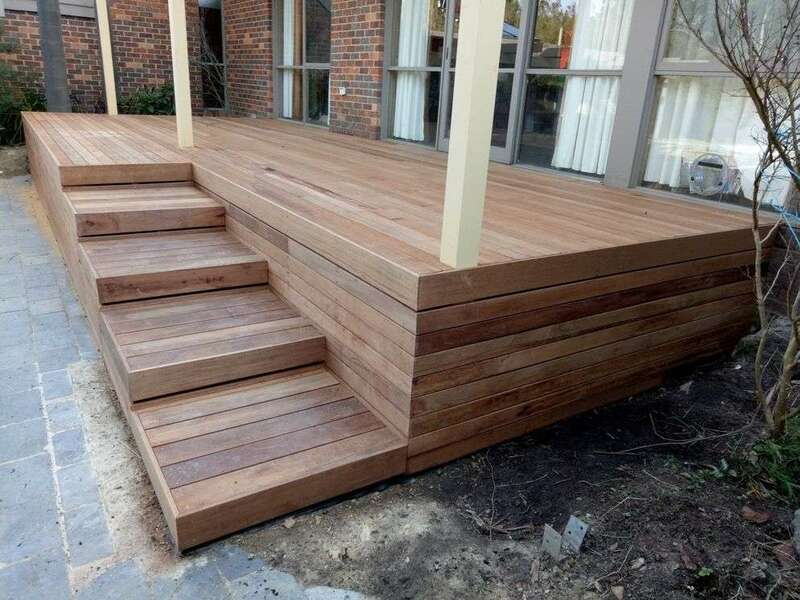 Features 1000 wide by 800 deep platform steps. This depth classifies the steps as a series of landings, and therefore complies with the BCA design rules for stairs. This verandah was designed to be sympathetic to the period style home, in an suburban area with a Heritage Overlay. It features rolled barge & ridge cappings, finials & gutter end returns & includes pre-primed v-jointed pine ceiling lining boards with two polycarb roof sheets. Cantilevered beam ends to special post stirrups, & the absence of the usual beam across the posts give this verandah a contemporary look. Half of the verandah is tinted polycarbonate roofing, with the other half colorbond with WR plasterboard ceiling. The owners of this one year old home facing a rather busy semi-rural road required a new verandah along the long north facing wall of their home. This provided much needed solar control into the main living areas, a safe play area for the kids, and a visual buffer between the home & road. 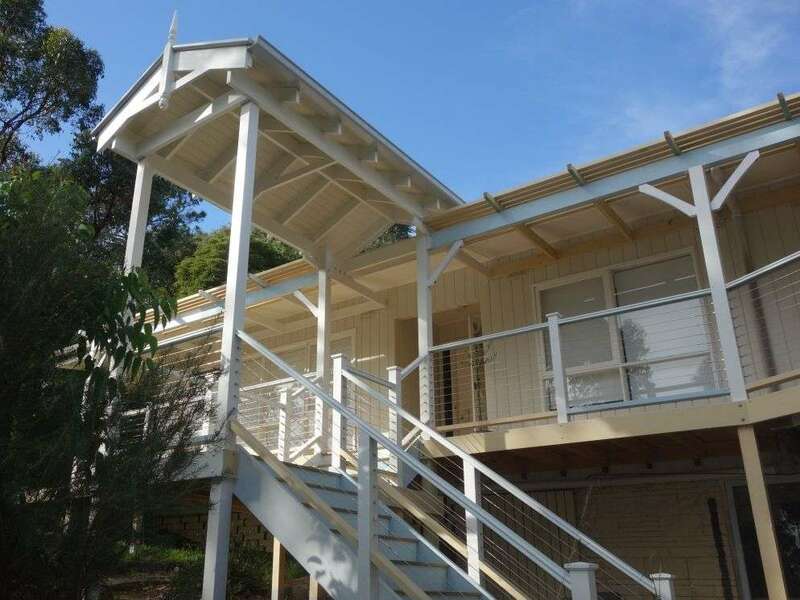 The verandah was designed to complement the architectural style of the home, matching the existing front verandah in materials, colour and construction detail. 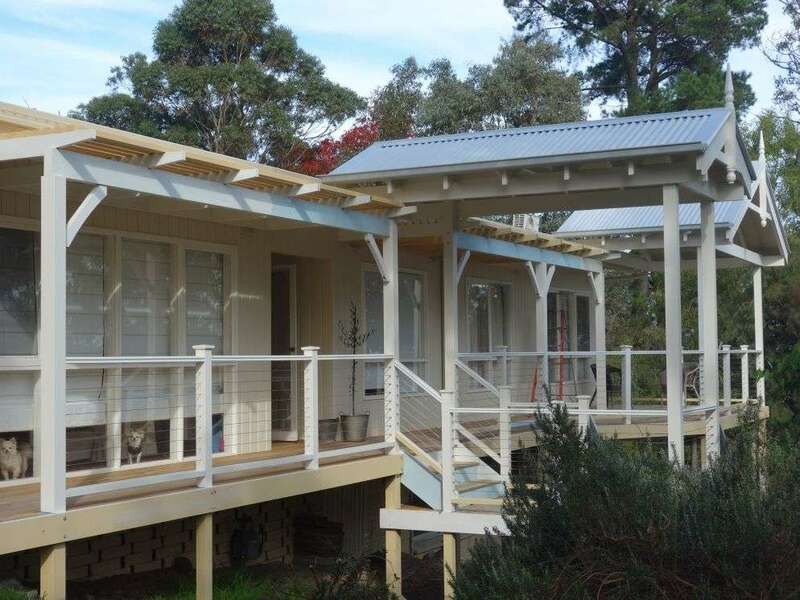 As with all our verandah projects, pre-primed LOSP framing was used to provide a superior quality of finish & long term servicability compared with the more commonly used (and cheaper) lasercut treated pine. 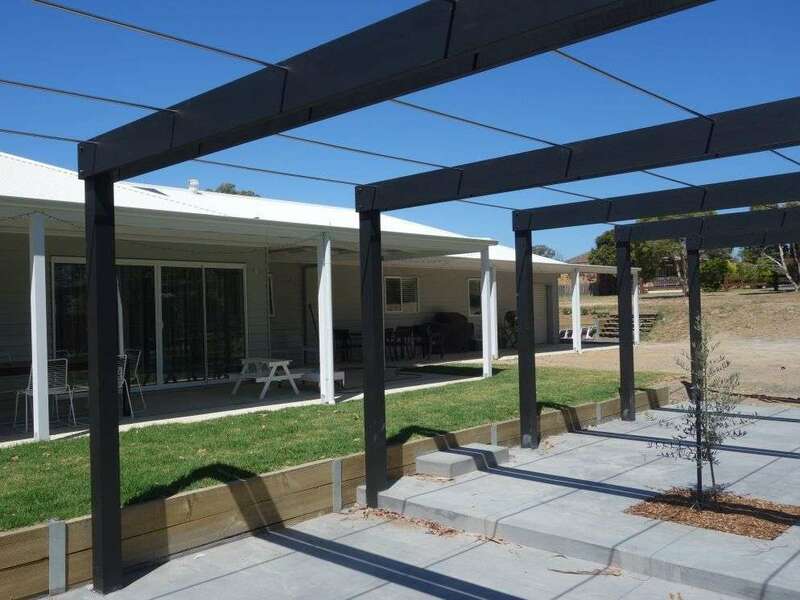 A pergola built between the new verandah & road provides further privacy , & a place in the sun for family functions. 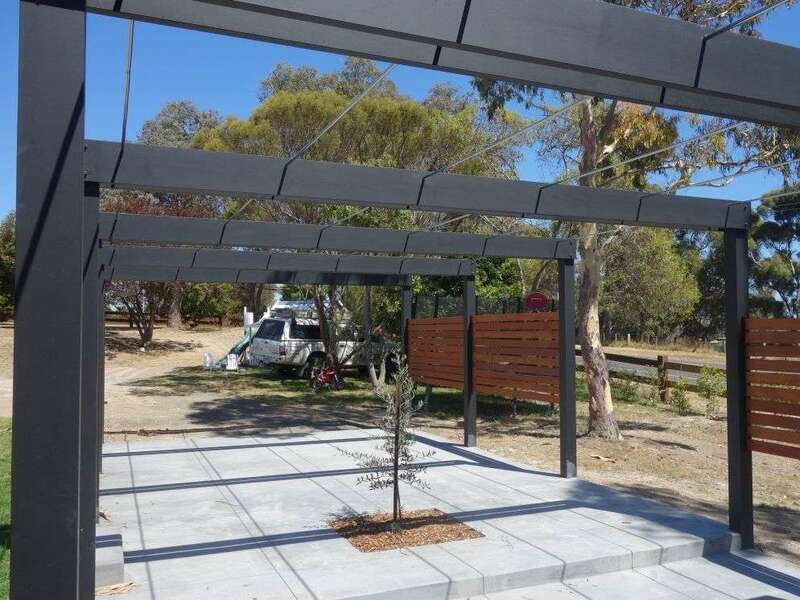 The pergola concept involved 6 black painted portal frames, using 135x135 posts, tensioned together using 6.4mm ss cable inside 16mm x 1.6 ss tubes. The resultant sculptural contemporary structure has become a local feature. This timber home had a rather bland facade fronted by a balcony deck in a bad state of repair. The Clients wanted to not only rebuild the balcony, but to enliven their home's street frontage and appeal, while providing improved , undercover access to their front door & a covered relaxation area associated with the master bedroom. To suit the older style of the home, several decorative elements were incorporated, including exposed rafter ends, finials, post capitols & post brackets. The large, northern windows are sun-shaded by a new slatted awning, This feature also integrates the otherwise separate central verandah, stair & landing, with the larger verandah & balcony at the end, to provide a unified & cohesive architectural solution across the length of the facade. 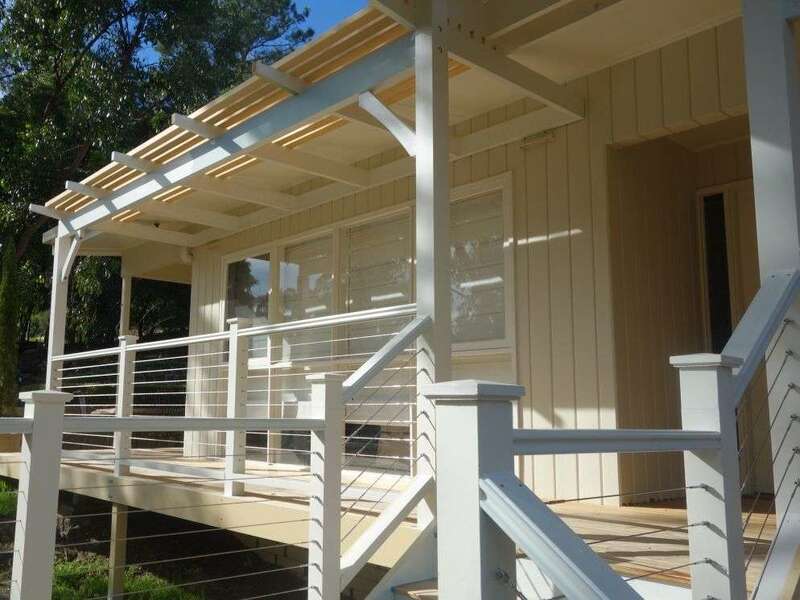 Also featured is 100mm wide Yellow Stringybark decking, exhibiting all the characteristics of a typical Australian HW, & hydraulic swaged stainless steel fittings to the ss wire rope balustrading. 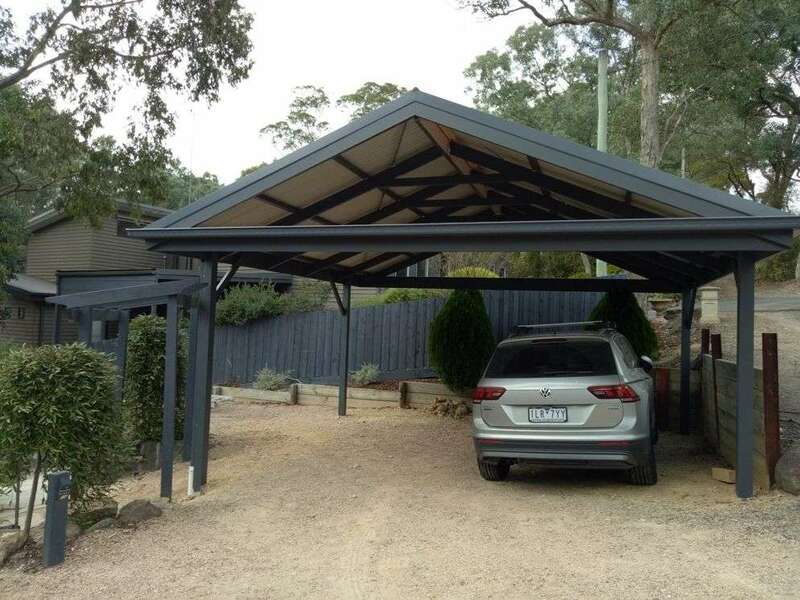 We obtained the planning permit necessary to build this carport to the street frontage in a bushland setting. Measuring 6m x 6m, the gable roofed structure is framed using pre-primed LOSP timber. Offset corner posts allow for easier turning, & avoid damage to opening of doors. This design extends the form & shape of the existing home over the new patio area, & required a planning permit. The 5.5 x 14m structure features Monterey Cypress, a sustainable timber recycled from farmland. 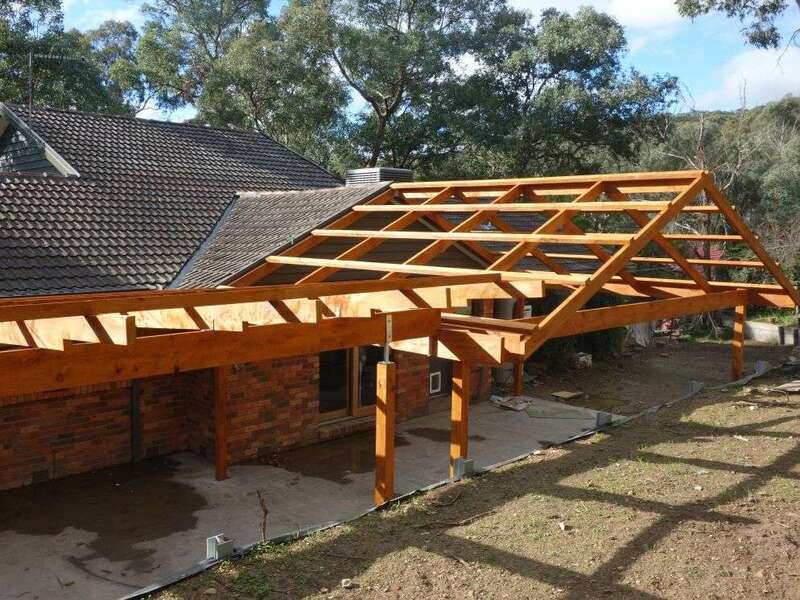 The picture shows the completed frame, prior to colorbond roof installation.